William Shakespeare, the most celebrated poet in the English language, left behind nearly a million words of text, but his biography has long been a thicket of wild supposition arranged around scant facts. With a steady hand and his trademark wit, Bill Bryson sorts through this colorful muddle to reveal the man himself.Bryson documents the efforts of earlier scholars, from academics to eccentrics. Emulating the style of his famous travelogues, Bryson records episodes in his research, including a visit to a bunker-like basement room in Washington, D.C., where the world's largest collection of First Folios is housed.Bryson celebrates Shakespeare as a writer of unimaginable talent and enormous inventiveness, a coiner of phrases ("vanish into thin air", "foregone conclusion", "one fell swoop") that even today have common currency. 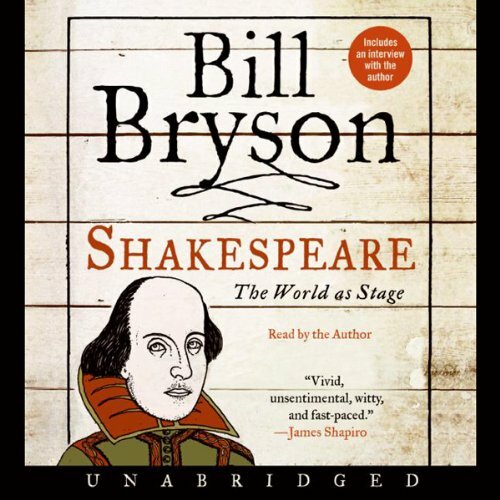 His Shakespeare is like no one else's: the beneficiary of Bryson's genial nature, his engaging skepticism, and a gift for storytelling unrivaled in our time.